A recently discovered football programme has shed new light on a match featuring a team of Nazi forced labourers, thought to have been thwarted by German authorities. The 1943 game was planned between occupied Guernsey's league champions and a "Continental XI", featuring Spanish, Belgian and French labourers. But an eleventh-hour intervention prevented the game going ahead. The rare programme was "remarkable", a Cambridge University historian said. The match on 8 June 1943 did happen but instead of the Nazis' workers playing, a second Guernsey side was drafted in on the day of the game. The teams were "revised" because of "circumstances which could not have been foreseen," a censored island newspaper reported. "Instead of playing a Continental XI, the Occupation Champions, V.O.B.A, will meet an Island XI," The Star read. It is likely the occupiers would have wanted to prevent the foreign workers, including some former professionals, mixing with locals, Cambridge historian Dr Gilly Carr said. "Such solidarity would not have been welcomed by German forces at this stage in the occupation." The document was "remarkable", Dr Carr added, and could be studied further as it provided tangible evidence of the forced labourers' presence in the island. To the surprise of the paper, the hastily-assembled side beat the league champions 4-2, despite them having a player who would become one of Guernsey's most famous footballers. Len Duquemin had "terrific shots at goal, only to hit the upright or crossbar, with a resounding whack," the paper reported. 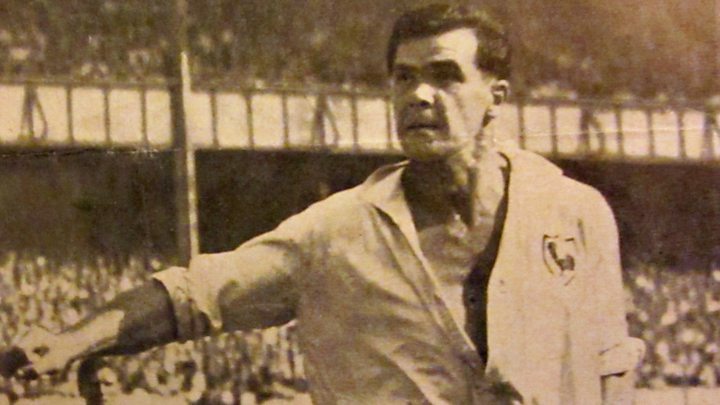 After the war, the striker would go on to play for Tottenham Hotspur, scoring 134 goals in 307 appearances. The matchday programme was found at the home of Dorothy Dowding, a former Star journalist, who died in January, aged 98. "I'm a keen football fan, and my father very kindly handed it down to me," her grandson Ollie Dowding said. Dorothy had mentioned the programme to her family after reports of another surfacing at auction in 2005 but hers was only found after her death. "It's something we'll definitely keep in the family and I hope to pass it on to my son one day so he's got a little bit of local football history as well," Mr Dowding said.